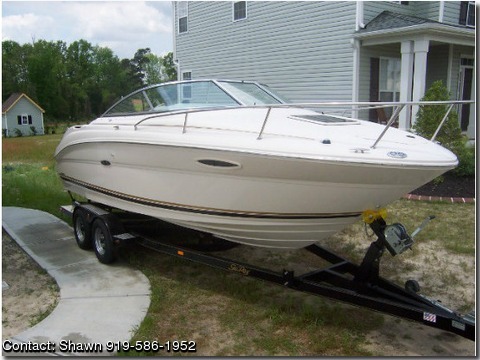 Contact the owner Shawn @ 919-586-1952 or smdowns1966(at)gmail(dot)com.2002 Sea Ray 225 Weekender,2002 Sea Ray 225 Weekender, This boat is a don't miss opportunity. Folks will think it's brand new from the glossy finish. The boat only has 118 hours of freshwater use only. It's a great boat for pleasure boating, short overnights, fishing, or just having good old fun with the family tubing and skiing. The boat has a porta potty, galley sink, and a pressure water sprayer located at the rear of the boat. The gel coat finish and the upholstery are in very good condition. The boat is powered by a 5.0L MPI Mercruiser 240hp Bravo III stern drive. Boat comes equipped with canvas package, boat cover, compass, bow anchor, depth finder, tilt wheel, and AM/FM CD player. Included in the package is a Vanguard trailer.